Ombre Blonde Hair. Stocks with Amazon Prime offer come in medium size cap. 1.Lace Wig Type: Glueless Body Wave Lace Front And Full Lace Wig. 2.Hair Type: 100% 7A Remy Human Hair Lace Front Wig, Brazilian Hair Body Wave Human Hair Wigs. 8.Hairstyles:Straight Hair Wig For Black Women, African American Loose Wave Wigs,Brazilian Wigs. 9.Knots: Lightly Bleached Knots (Avoid Shedding Problem), Double Knots For Whole Head, Light Bleached Knots. 10.Quality:Natural Hairline,Baby Hair Around The Periphery,No Shedding,Very Soft,Very Smooth. 2.Hair Color:Ombre Blonde Color,The Human Hair Ombre 613 Virgin Human Hair Lace Front Wig,100 Brazilian Human Hair Full Lace Wigs. 3.Lace Color:The Straight Hair Wigs With Medium Brown Lace Color In Stock,Light Brown,Dark Brown Lace Color Need Customized. 4.Cap Size:The Straight Blonde Wigs With Medium Size Cap In Stock,Small Cap And Large Cap Need Customized. 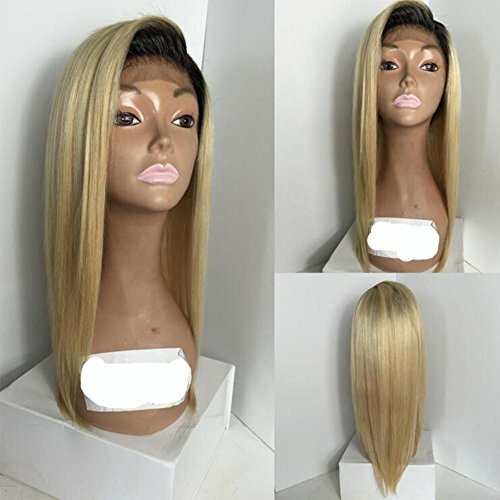 5.Important Information:130% And 150% Density Stock, Lace Front Wigs And Full Lace Wig Middle Part With Baby Hair,If Customer Don't Write Lace Color And Cap Size,We Will Ship The Medium Brown Lace And Medium Cap Size. If you have any questions about this product by KRN, contact us by completing and submitting the form below. If you are looking for a specif part number, please include it with your message.